OLD ORCHARD BEACH, MAINE –Ronald J. Blow, 78, of Old Orchard Beach died of Mesothelioma, May 28, 2018, in Southern Maine Medical Center in Biddeford, Maine. He was born June 29, 1939, in Biddeford, a son of Virginia Ethel Ricker (Olofson) and Arnold Ridlon Blow; raised by his step-father Gosta A. Olofson. 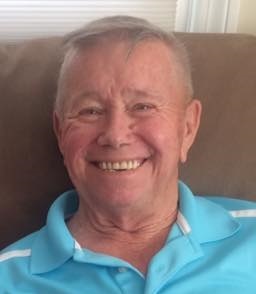 He was a lifetime resident of Old Orchard Beach and educated in the Old Orchard Beach School elementary system. He was a graduate of Thornton Academy in the Class of 1957. He obtained a Marine Engineering Degree from Massachusetts Maritime Academy. He served in the US Navy from 1957 - 1963 and later in the Merchant Marines as a Chief Engineer for the Boston Fuel and Boston Tow Tugboat Companies in the Boston Harbor Massachusetts area for several years until his retirement in 2001. He was a member of the US Maritime Union. On June 23, 1965, he married Beatrice Elizabeth Clayton in Lynn, Massachusetts. Starting in the early 1960’s, Ron developed a passion for the game of Golf which he learned at the former Old Orchard Beach Country Club where he was a member for several years until its closure when he transferred to Deep Brook Golf Course, Saco until his death. He wintered in Fort Myers, Florida for several years so he could enjoy the warm weather and play golf year round. During his lifetime, he served as a member of various civic and veterans organizations. At the time of his death, he served as the Inner Guard at the Biddeford –Saco Lodge of Elks # 1597 in Saco, Maine. In addition to the Elks, his services in other civic and veterans organizations included Masonic group St. John Lodge in Newburyport, MA as Grand Master, American Legion in Old Orchard Beach, and the Eagles in Saco, Maine. A strong supporter of the Salvation Army. Pre deceasing him besides his parents is a step son, James Ernest “Jim” LaFlam; three brothers, Walter Blow, Alan Olofson, and Gerald Olofson; and two sisters, Anna-Lisa Olofson and Elna-Marie Olofson. Survivors include his wife, Elizabeth Blow and daughter, Heather Ann Forrest both of Old Orchard Beach; a step son, John Harrison of Augusta, Maine; a sister, Suz-Ann Olofson; 2 brothers, Dennis G. Olofson; both of Fort Myers, Florida and James K. Olofson of San Diego, California; 2 very dear granddaughters, Kayla Taylor and Ashley Forrest; His other grandchildren also include Elizabeth, Joshua, Sara Beth, John Michael, Benjamin, Naomi, Lisa-Jo, Jeffrey, and Karyn. Visitation will be 5-8 PM, Friday, June 1, 2018, at the OLD ORCHARD BEACH FUNERAL HOME, 36 Portland Avenue, Old Orchard Beach. Graveside Services with Military Honors will be held at 11:00 AM, Saturday, June 2, 2018, in The Deering Park Section of Laurel Hill Cemetery in Saco. Condolences may be sent to oobfh.com. In lieu of flowers, the family is asking individuals to donate to a charity of their choice in his memory. Some of his favorite charity groups included the Salvation Army and Wounded Warriors.